…and other such helpful advice I would happily offer any beginning ‘sewist’ today. More tips like this in an upcoming (as yet unwritten) post. For now, I wanted to show you something cool. 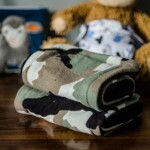 I’ve included a few affiliate links in this post. If you happen to order from them, I earn a small percentage of the sale (this costs you nothing additionally). I got this set approximately a year ago and it was a game changer. I don’t use that term lightly — or at all in the history of my being, actually, now that I think of it. 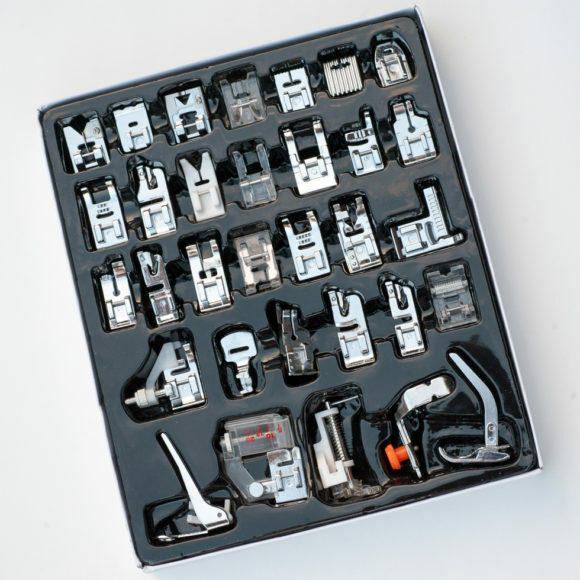 It’s a set of 32 different presser feet that work with most of the popular sewing machine brands, and it unlocks the potential for so many more projects! This thing has nearly every presser foot you could want at various levels of sewing expertise, beginner through expert. The only thing I’d add to it is an even feed foot (sometimes called a walking foot) — these are probably more difficult to make universal though, which may be why one of those is not included. This set is a great value for the money, especially when you look up the prices of individual presser feet. 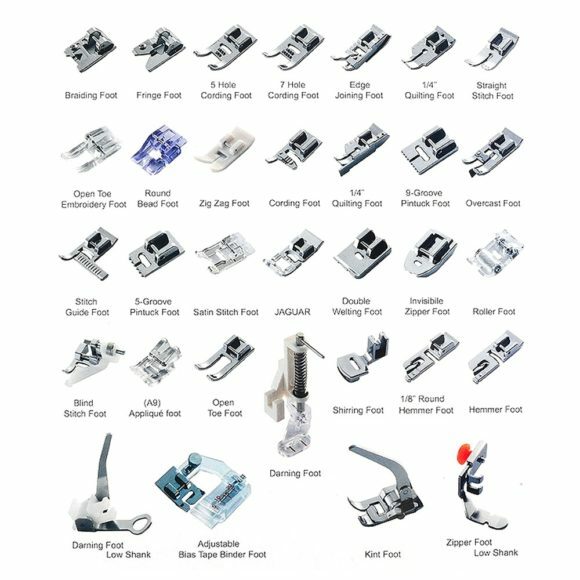 Here is an illustrated though kind of hard to read graphic of the names of the included presser feet in the 32 piece set. My favourite presser feet so far? Knit foot. Absolute fave. I love sewing up comfy jersey knit scarves for my shop, and this feeds the fabric through the sewing machine so nicely without any bunching or stretching. It’s truly unbelievable how it works compared to your regular foot and it’s the next best thing to having a serger. (I’d say it’s kind of better, as there’s almost no learning curve to worry about with a knit foot.) 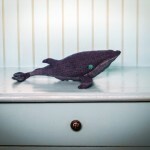 See my post about the knit foot here. Rolled hem foot. There are actually a few different sized rolled hem presser feet in the 32 piece set! These feet make for beautiful, easy and professional looking hems on things like linen tea towels and any lighter material that is tedious to press and hem. Open toe embroidery foot. Use this for applique and also for applying ribbons. The front of this presser foot is wide open so that you can see everything you’re doing. The back has a channel through which denser applique stitching and ribbons will flow without getting caught up in the foot or in your machine! Fringe foot. You can make decorative fringe with this foot so easily! I haven’t tried it for longer fringe, but for shorter fringe it works great! 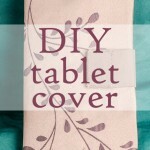 Here’s a tutorial that will give you some ideas — I love SewingPartsOnline’s videos! Quilting foot. Having an available 1/4″ width on your presser foot makes for easier quilting — that’s for sure. Those are just the ones I’ve gotten the most mileage out of in my own short time with this set. 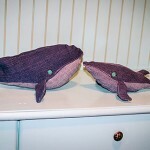 Depending on the kind of sewing you prefer to do, you may like these or some of the other ones even more. Having a wealth of presser feet available makes projects easier and allows me to do lots of cool stuff I never even considered before getting this set. I’d recommend it to anyone starting out, intermediate, or expert because there is just so much versatility in this kit. 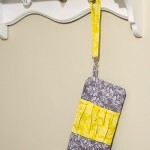 It also makes a really great gift for anyone who sews! Please feel free to share this post (if you are so inclined) on Pinterest or wherever you normally share all the good stuff! Have you got the 32 piece presser foot set? If so, what is your favourite foot to use? 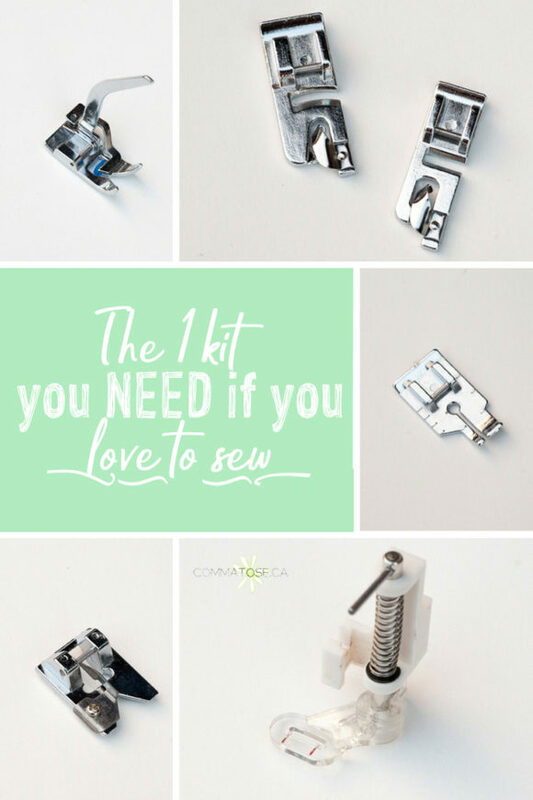 Share the post "The ONE kit you need if you love to sew"
Tagged 32 piece set, sewing. This would probably depend on your fabric choice. There are rolled hem feet in several widths which would probably work best on a flannel etc, but could work on a knit with some patience.